The face of cricket may be changing to pink. 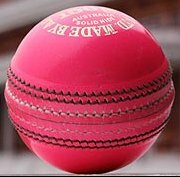 The powers that be at the MCC (the guardians of the rules of cricket) are in the process of starting trials of a pink cricket ball, with the hopes it will replace the white ball used in Day/Night, Twenty20 and one-day international cricket by 2009. The reasoning is quite simple. The red ball lasts a long time - about 80 overs - however the white ball lasts less than half that before it starts dulling severely and becoming increasingly hard to see as the paint wears off the leather. It's also a bit difficult to see it against floodlights. The MCC gurus are hoping the pink ball is the answer and have asked Kookaburra to produce a batch for testing over the winter. It'll be interesting to see how the tests go. Who knows, maybe one day every little boy will want a pink cricket ball.